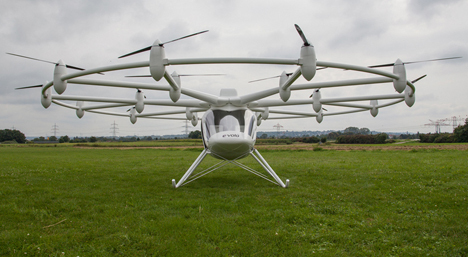 The German-made “private helicopter” is the product of the engineering team at E-volo. The VC200 model took its first flight earlier this year. It’s friendly to the environment, emission free and boasts an almost ridiculous number of rotors. The eye-popping 18 of them replace the fuel-burning combustion engines of normal helicopters. 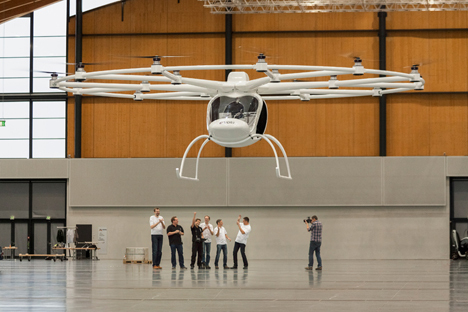 Meant as short distance transportation, it’s a two-seater that would typically travel around 60 miles at heights of up to 6,500 feet. 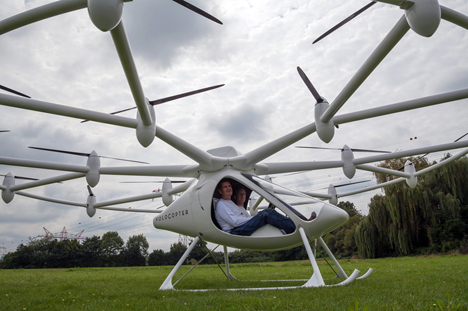 The Volocopter is meant to be very user-friendly. Its website goes on to state that “the pilot pays little or no attention to the flight path angle, minimum speed, stall, mixture control, pitch adjustment and many other things which make conventional aviation so demanding.” Sleek and feature-loaded, its six central battery blocks have reserve storage of up to 50%; even if two of them fail, a safe landing is possible. Last year it was awarded the 2012 Lindbergh Prize for Innovation.